Trailer for 'Ice Age: Continental Drift,' directed by Steve Martino and stars the voice talents of Ray Romano, Karen Disher, Queen Latifah, John Leguizamo, Chris Wedge, Denis Leary, Wanda Sykes, Josh Peck and Ciara Bravo. 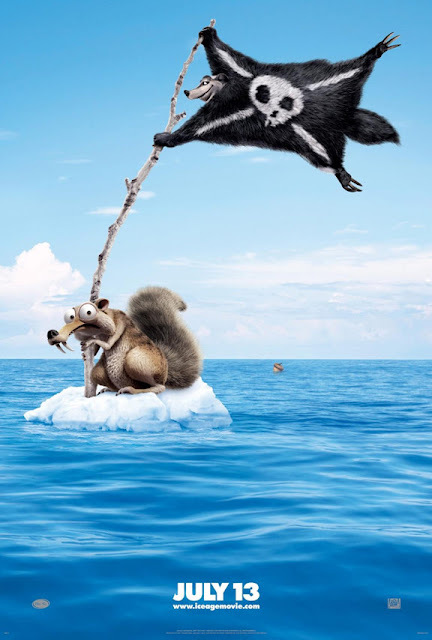 Scrat's nutty pursuit of the cursed acorn, which he's been after since the dawn of time, has world-changing consequences -- a continental cataclysm that triggers the greatest adventure of all for Manny, Diego and Sid. In the wake of these earth-shattering upheavals, Sid reunites with his long lost family, and the gang encounters a ragtag menagerie of colorful new characters determined to stop them from returning home. It opens 13 July 2012 for the US, 6 July for Ireland and the UK.